Asian Games 2018 Athletics: With the hope to secure more medals in track and field events in the upcoming Asain Games 2018 in Indonesia than the last edition in 2014, 53 athletes will walk onto the Jakarta tracks. Among these Jinson Johnson is one of the many who looks promising to finish on the podium. Here's a look at Jinson Johnson's career. Jinson Johnson, the first athlete to qualify for men’s 800m event in Rio Olympics since 1984 is a Junior Commissioned Officer (JCO) in the Indian army. Born in Chakkittapara village of the Kozhikode district of Kerala, Johnson will present India’s challenge in 800m and 1500m events at the upcoming Asian Games 2018 in Jakarta, Indonesia. Started running at an early age, Jinson is said to have caught the eye of Peter Karimbanakuzhy, coach at the Chakkittapara village sports Academy. 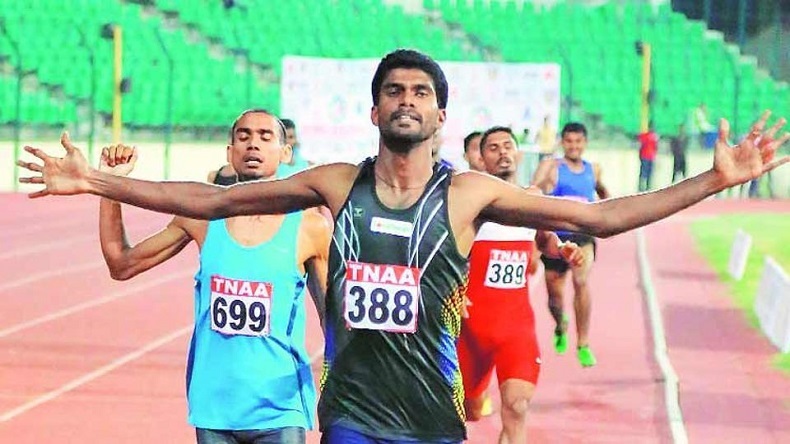 From the academy, Jinson never looked back, he won gold medals in 800 meters at National Junior Sports Championship at Vijayawada in 2007 and the 1500 meters at the National School Meet, Kolkata. He ran the third-fastest race by an Indian in the 800m category, qualified for his first-ever Olympics at the Indian Grand Prix in Bangalore. Johnson is said to be the next big thing in athletics and his timings justify the fact. Johnson has clocked 1:45.98 seconds, even better than the 1:46: 00 seconds in 800m event at Indian Grand Prix to present his challenge at the Asian Games 2018. In the Commonwealth Games 2018, he finished fifth setting a new national record in the 1500 metres race by breaking the 23-year-old record of Bahadur Prasad. His major achievement came in the form of the silver medal in the 800 metres event of the 2015 Asian Athletics Championships held in Wuhan with a time of 1:49.69. Buoyed by the performance, he went on to win three gold medals at the Asian Grand Prix in Thailand the same year. Professional Highlights: Johnson has won 3 gold medals in Asian Grand Prix in 2015, Silver medal in 2015 Asian Athletics Championship in Wuhan. Then he became the first Indian to qualify for the Men’s 800m event since 1984, and in the 2018 Commonwealth Games, finished 5th to break the 23-year-old record of Bahadur Prasad.